Jennifer Lockwood-Shabat is the President and CEO of Washington Area Women’s Foundation, a public foundation dedicated to mobilizing the community to ensure that economically vulnerable women and girls in the Washington, DC metropolitan region have the resources they need to thrive. Jennifer joined the Foundation in 2008, providing strategic guidance while leading the program, development, and communications functions. Jennifer has devoted her entire career to improving the lives of low-income and underserved women and girls. Prior to joining The Women’s Foundation, Jennifer served as the Director of Public Policy at the National Family Planning & Reproductive Health Association, where she advocated on behalf of publicly funded family planning clinics and worked to improve access to family planning services for the low-income and uninsured. Before that, she spent 10 years at Women’s Policy, Inc., where she directed the organization’s policy research and analysis and worked extensively with the Congressional Caucus for Women’s Issues. In 2013, her efforts were recognized by Capital One and the Washington Mystics when she was named a Community Champion. Jennifer currently sits on the Mayor’s State Early Childhood Development Coordinating Committee and is a 2014 Ford Foundation Public Voices Fellow. 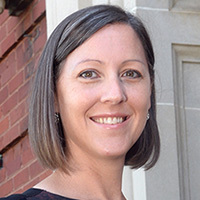 Jennifer holds a master’s degree in international policy studies with a concentration in women in development from the Monterey Institute of International Studies and a bachelor’s degree in political science from the University of New Hampshire. She resides in Northern Virginia with her husband and two daughters.